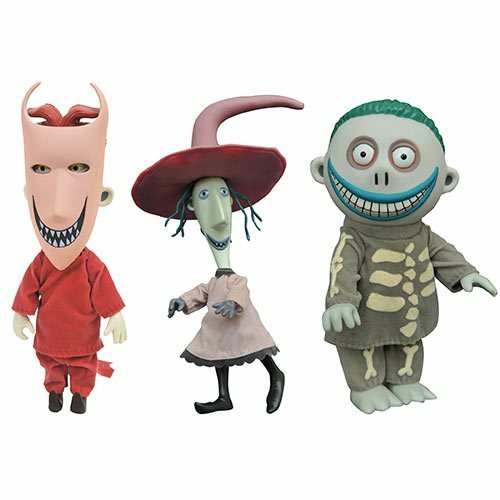 Shopping for Nightmare Before Christmas Dolls? What are they up to now? The Nightmare Before Christmas Deluxe Collection is back, and it's more deluxe than ever before! The Nightmare Before Christmas Lock, Shock, and Barrel 3-Pack Deluxe Doll Set is the line's first three-pack, with removable hat and masks! Each cloth-costumed figure looks like it stepped off the movie screen, with multiple points of articulation. Lock, Shock and Barrel each measure approximately 5-inches tall. Ages 8 and up.